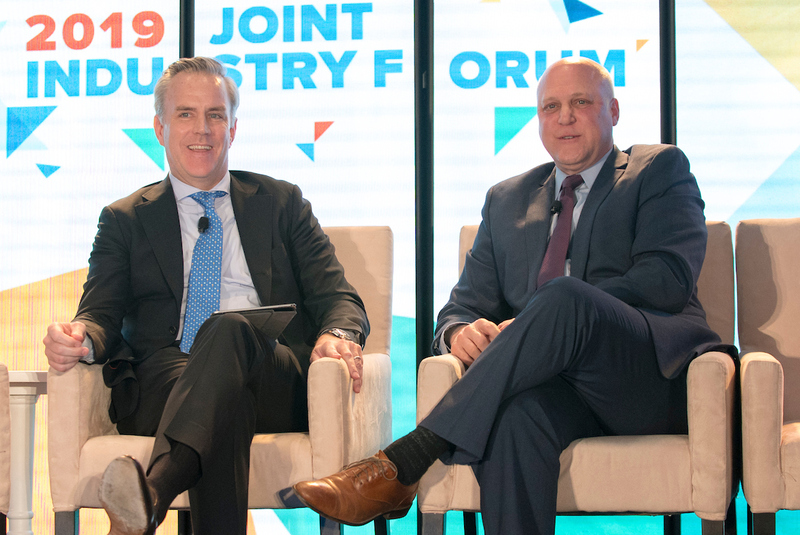 9 Joint Industry Forum concluded its speaker sessions with an informative discussion between Sean Kevelighan, CEO of the Insurance Information Institute and Mitch Landrieu, forms Lieutenant Governor of Louisiana and two-term New Orleans Mayor. Leading the city of New Orleans, post Hurricane Katrina, Landrieu learned the importance of building "social resilience" in addition to infrastructure for disaster preparedness, "It is very important to be able to talk to someone quickly after a disaster," he noted. Resilience and leadership came up as the discussion moved to national politics. "The country works well in partnership and collegiality", something Landrieu believed was lacking amid the government shutdown. The collaborative rebuilding effort from neighborhoods to local governments was one of the most important aspects to the lengthy rebuilding period from Hurricane Katrina. When asked about what he would focus on if he were president, Landrieu quickly responded that he, along with most Mayors would probably focus on infrastructure. While witnessing the failure of the livelihood during Hurricane Katrina, first saw the devastating affect that poor infrastructure can have. Such failures show the need to build resilience, so that when disaster strikes all parties are better prepared to respond.